Convert your removable dentures to Implant supported fixed prosthesis in a Day. 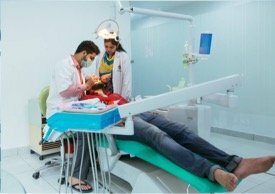 We have the best Implantologist team comprising of Prosthodontists, Oral Surgeons, Dental Technicians In house, Hyderabad, India. Contact us with your specific questions. Full mouth dental Implants can be done with bone graft and graft-less implant solutions. Why implant placement is difficult in posterior maxilla (Upper Jaw)? More Time: Bone graft (6months) – Implant – 3months – Prosthetics. Whole procedure takes 9 to 12 months. Obliteration of functions of Maxillary Sinus: Imparting the resonance of voice, Absorption of shocks to head, Filtration, Humidification, Warming of air, Lightening of skull, Regulating Intra nasal pressure. We get many failures because of the poor bone density in the upper molar region in the upper jaw. Most of the cases get failed not just because of the bone quality also because of the bone quantity. Because of the pneumatisation of sinus, the bone available to place is limited and is less. Hence we are forced to use shorter implants. Because shorter implants don’t have good bone implant contact- BIC, the Osseo integration is less when compared to a larger or a Taller implant. Also because of heavy loads in the molar region, any minor faults done by the technician or the dentist will lead to implant failures in the upper back jaw region. Sometimes the implants fall into the sinus during the healing period. This needs an additional surgery to remove it which is traumatic to the patient. Most of the cases there are no rejections but sometimes there are failures which one should expect and take the risk. In that case, the implants are rejected you still have an option of the conventional flap opening invasive grafting procedures. What is TTPHIL – ALL TILT TM Technique? No bone graft is necessary.Bone density is very good in the pterygoid region. Moreover the resorption in these pterygoid plates area is very minimal. The outcome is predictably successful. The anterior-posterior spread is maximized; there is no need for cantilevering. The fixture is placed at an easy angle to restore. 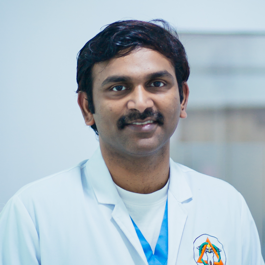 Tuberosity reduction or other tissueplasty can be done simultaneously. Patient Assessment Level- Reason for Visit, Patient Demands, Risk Assessment, Different treatment options in posterior maxilla- Implant Paradigm shifts- Graft and Graft less Solutions- History and Rationale of Pterygoid implants –Types of Pterygoid implants. Screw on Multi-unit Abutments Non-hex abutments. We do precise machined CAD CAM Screw retained technology to get the best passive fit. With this procedure, there will be NO SCREW LOOSENING. Materials used: All prosthesis is done with only CAD-CAM. No manual processing is done at all. For precise passive screw retained technology we have to use CAD-CAM technology only. 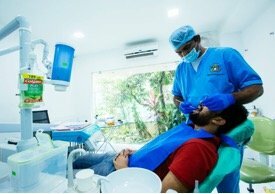 We at The Dental Specialists give different solutions to our patients based on their requirements. Depending on Individuals and their requirement we need to give the prosthesis.